Monsanto Philippines Inc. strengthened its campaign to food sufficiency and access to balanced meals in the country by recently contributing planting materials, such as seedlings, to over 54 families at Monsanto – Gawad Kalinga (GK) Village in Barangay Aldeguer, Sara, Iloilo. 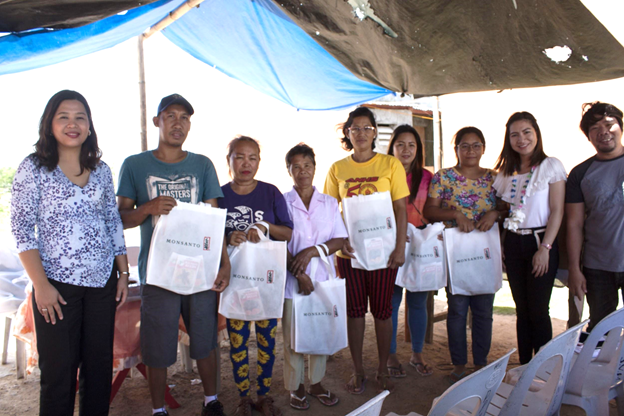 Corporate Affairs Lead Charina Ocampo of Monsanto Philippines, together with Monsanto-GK Village President Hadjie Balome, led the turnover of planting materials in the village, encouraging members of the community to grow their own vegetable garden. Monsanto shared 540 packs of bitter gourd, squash and string bean to the members of the village, which are meant to establish a sustainable source of nutrition in the community. According to Balome, the project not only helps the community to access balanced meals but also helps them to potentially earn. “These seedlings do not require high maintenance when planted and they actually grow relatively quick. This also allows the community to readily have healthier food options. Since they’re easily harvested, they can also choose to sell them,” Monsanto-GK Village President Hadjie Balome said. Ocampo explained that besides the houses they built together with GK in 2016, the company also wanted a holistic approach to community development by providing opportunity for the locals to become self-sufficient through farming. Aside from the seedling turnover, Monsanto also led a feeding program for the members of the community. “We are grateful for Monsanto in continuously choosing our community as a beneficiary. We are especially thankful for the seedlings that they provided us. Our families, especially our children, can now have more nutritious food on our plates,” said Imelda Cataluna, one of the GK beneficiaries. The effort in Sara, according to Ocampo, was part of the broader initiative of Monsanto to boost its community efforts in Iloilo, including nutrition. Prior the turnover in Sara, Monsanto in fact launched its mobile nutrition caravan, dubbed as Monsanto Fun Kitchen, at Nabitasan Elementary School to over 415 students, parents and faculty. The program shared easy-to-cook corn recipes meant to improve nutrition in the school, which is vital for child performance and productivity.